I'm back to school! Year 13, my last year of high school. We started school on Friday (strange, eh?) and on Thursday I was so sick of writing my extended essay I decided to ditch it and went to bake instead. I think I definitely deserved that baking session because I was working non-stop for the last week already! I digress. Back to these shortbreads, these wonderful shortbreads. I know that they were all the rage around two years ago amongst many food bloggers, and I am the extremely untrendy latecomer that chose to bake these two years later on a whim. But I'm glad I did, because after the first bite, the recipe went straight to my keepers list. 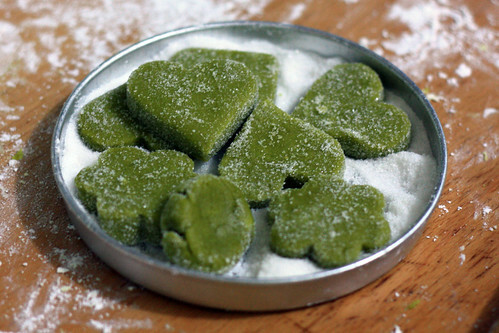 And of course I'm talking about the famous Kelli's Green Tea Sweets! They are buttery and crumbly, and the green tea flavour was prominent enough to be noticed, but not overpowering that the whole thing tastes bitter. And the texture is lovely too - delicate and melt-in your mouth, but surprisingly both the dough and baked cookie held up really well. The shade of green came out perfectly - I thought that the matcha might have lost its colour after baking - I think the colour is very pretty! Along with the teeny crunch from the granulated sugar, it's currently ranking high in my favourite cookie list. I also recieved the 'Kreativ Blogger' award from 17 and Baking (another teenage baker - yay!). Thanks Elissa! 1. I'm planning to study Biochemistry. Yeah, that's what I want to study at uni. Wish my luck in my uni applications (which are starting like....now!) - I am currently working through my personal statement. 2. I wish I could write better. I wish I was able to write more enticing posts, describe food better, but unfortunately, writing is not my forte at all! 3. I have a younger sister. Her name is Venus, and she eats alot of the stuff I make. We laugh at silly things together. 4. The thing I really hate in the world now is IB. Yes, I cannot express my hatred for this thing enough. The workload is so high it's incomprehensible. Normally on a school day, I sleep at 12 at the earliest, and the worst so far - I've stayed up until 3am, working. 5. I'm a Scout! Yep, I am currently a member of my Venture Scout troop, in a Scouts group I've been at since I was 10. I really love camping, because it's just so relaxing and fun when you go crazy with your friends in the middle of nowhere. 7. I love The Pioneer Woman. Pioneer Woman Cooks! was the first food blog I read, I still remember that the post was the Chocolate Sheet cake. Now, I read all the sections of her site, and I secretly wish I can live at a her ranch too. Aaaand, I'm passing this along to Happy Home Baker, Florence of Do What I Like, Elyn of e's joie and Doreen of Desserts. Yum. 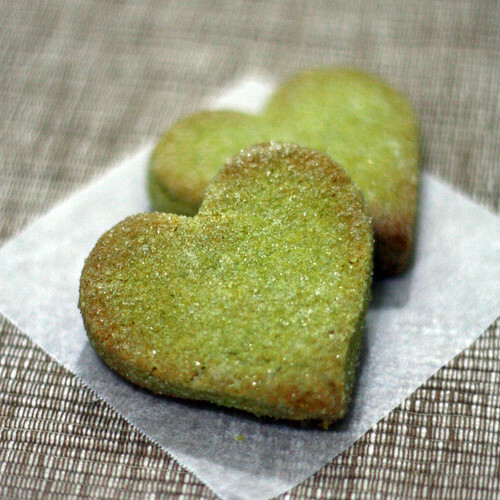 Have you tried these matcha shorbreads yet? If not, I think you should go make them now! Alright, I'm going back to work - I'll try to squish in a few posts about some of my other bakes/makes from summer soon! 1. Preheat the oven to 350F (175 C). Line a sheet pan with parchment paper. 2. Whisk the confectioner’s sugar and green tea together in a bowl. Add the butter and green tea/sugar mixture to the bowl of a stand mixer fitted with the paddle attachment. Mix until smooth and light in color. 3. Add the flour and mix until well combined. 4. Add the egg yolks and mix just until the eggs are fully incorporated and a mass forms. 5. Form the dough into a disk and chill in the refrigerator until firm (about 30 minutes). 6. Roll the dough out to ½” (around 1cm) thickness. 7. Cut the dough with a leaf cookie cutter. 8. Toss each cut cookie in a bowl of granulated sugar to coat. 9. Place the sugar-coated cookie on a parchment lined pan. Bake at 350F (175 C) for 12-15 minutes, or until slightly golden around the edges. Wow!You are very talented Wendy!I followed you from the foodieblogroll and I am impressed by all the treats that I found here in your blog.I'd love to guide our readers to your site if you won't mind.Just add your choice of foodista widget to this post and it's all set, Thanks! they look really cute and I bet they taste great as well. I love the photo of the raw cookies! :D So green and "matchey", I can almost feel the smell! Wow, thanks to your link I discovered "17 and baking". She rocks! I revisited your matcha buns. These look great! 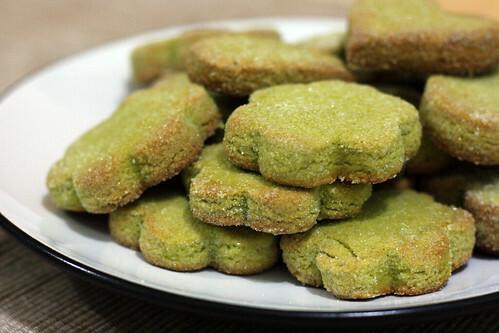 I recently got a box of matcha shortbreads. And they looked exactly like yours! wow you really impressed me with all your cakes and baking. You re already a professional. I think 2.25oz is equal to about 64g and 8.5oz is equal to about 241g, which is different from the measurements written in the above recipe for the confectioners sugar and all-purpose flour, respectively. Is this due to a typo, or did you adjust the measurements according to the amount you actually used to bake the shortbreads? I can't wait to try it out, but I just wanted to clarify the measurements for the said ingredients. Thanks! Hope your shortbreads turn out well! No problem. Using the amended measurements, I baked the shortbreads in a convection oven for 15 minutes at 155 degrees celcius till only very lightly brown on the edges, took them out of oven and left them on the tray for another 5 minutes before transferring them onto a cooling rack to cool completely. I haven't had shortbread cookies for a long time so I don't remember how the texture is supposed to be like. 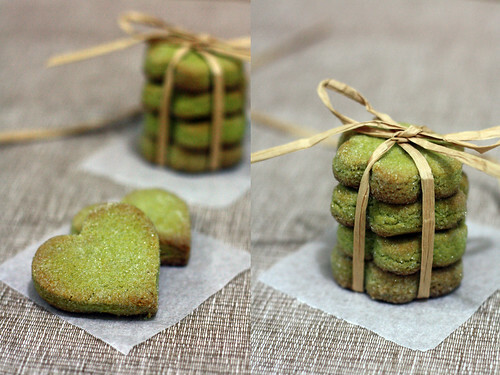 The matcha shortbreads were crisp on the outside but soft and chewy on the inside, do you think they were underbaked? Yes, I think your shortbreads were underbaked as I could spot some uncooked dough in the shortbread and it looks rather pale...Because of my tiny oven I usually bake in 3-4 batches, and after the first I let them coool and taste test them first and adjust the temperature or time afterwards. Hope that helps! Thanks Wendy, it's a helpful tip. I will bake it maybe 5-10 minutes longer on my next attempt, and try bake in batches so that I can check for doneness.